I like old cars. The way they’re built is different. They’re body on frame. It’s possible to unbolt the body, and the car remains drivable. 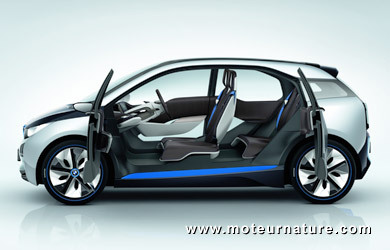 All cars have monocoques now with one unit body, but BMW chose to do something different for its upcoming electric car. It’s a new kind of body on frame, BMW calls it LifeDrive. One part of the car is “Life”, another is “Drive” (watch the video below). This last part includes the battery, the motor, and everything that makes the car drive, all together in a construction made chiefly from aluminium. To offset the heavy weight of the battery, the Life part of the car is made of carbon fibre-reinforced plastic (CFRP). That is where driver and passengers will sit. This allows BMW to announce that the complete car weighs only 2756 pounds, and that is quite exceptional. A steel-bodied gasoline car with the same dimensions would hardly be lighter. Yet, we are not sure of the dimensions. Our pictures show the concept, but the production model should be narrower. Only the length shall not change, and remains at about 152 inches. 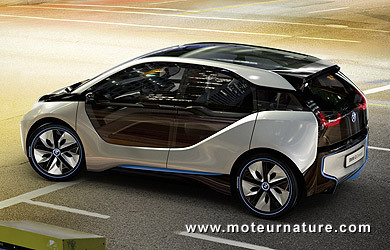 The i3 is a 4-seater. It’s also a 4-door, and that is more of a surprise. I was expecting a 2-door. Yet we see that the 2 rear doors are smaller than the front ones, and that they open up rearward, without a B-pillar. It’s just like on a Mazda RX8. I’m not sure the production model will keep this… More important to my eyes is the perfectly flat floor. That was the greatest feature of the Oldsmobile Toronado in 1966. It’s a great day to see that at last, another manufacturer has realized how much it can free up the interior when you remove the transmission tunnel and the center console. Another advantage is that it’s easy to move from the passenger to the driver’s seat. Again, that’s like the way it was in old cars. We don’t know much about the drive train. BMW only says that the motor is the same as the one in the ActiveE Coupé, which will succeed the Mini E later this year. So that’s 170-hp and 184-lb-ft of torque. Nothing is revealed about the battery besides that it’s lithium-ion, and that it comes from SB LiMotive, the joint-venture between Bosch and Samsung. Range is advertised at 150-km (93-miles), which is not much. Could there be an option of a larger battery? No, there won’t be, BMW’s working on a range-extender instead. It will be a small gas engine sending all its power to a generator. Considering that there isn’t much space for it, I bet on a bike engine rather than one from another BMW automobile. BMW has named this range-extending device REx, it will an expensive option on an expensive little car, thanks to the large use of CFRP, and a pack of lithium cells. 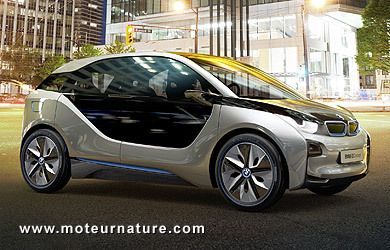 But the BMW i3 will be a luxurious automobile, built to a very high standard. Also, its performance will be worthy of the BMW name. The car is rear-drive, with a very low center of gravity. You can expect to go from 0 to 62-mph in less than 8 seconds. That, in normal mode. The i3 will also offer an “ECO PRO” mode that will reduce power everywhere (motor, air conditionning, seat heaters, etc) to increase range to a more useful 225 km (140 miles). 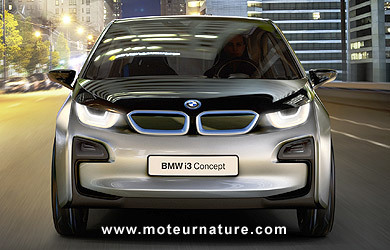 The BMW i3 will be available in the second half of 2013, I’m sure many will be waiting for it.